Eastman Tritan™ 코폴리에스터는 전자 빔 살균에 의해 어떠한 영향을 받나요? 의료 기기에 사용된 투명한 폴리머의 광학적 및 물리적 특성은 살균 과정에서 변형될 수 있습니다. 전자 빔 (e-빔) 방사선은 감마선, 에틸렌옥사이드(EtO), 오토클레이브, 저온 과산화수소 가스플라스마 등과 함께 의료 기기 살균에 많이 사용되고 있습니다. Eastman은 e-빔 방사선이 Eastman Tritan™ 코폴리에스터와 다른 투명 의료 폴리머의 광학적 및 물리적 특성에 미치는 영향을 확인하기 위해 연구를 수행했습니다. The objective of sterilizing medical devices is to reduce the bioburden to a safe level with minimal effects on the desired properties of its constituent polymers. Technology advances have improved the performance of e-beam radiation, making it a safe, efficient, and reliable source of energy for sterilization. High dose rates reduce the time of exposure, which can make e-beam a less costly alternative to gamma radiation. 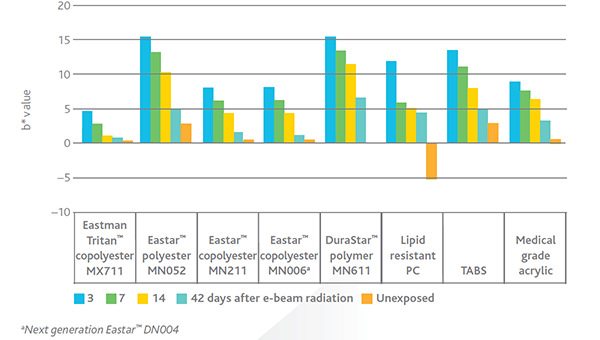 To study the effect of e-beam radiation on Tritan MX711, Eastman measured color shifting and physical property retention after e-beam radiation. Figure 1 shows the changes in b* value, which measures the blue to yellow scale after e-beam exposure at 50 kGy. Photos of the molded samples before and after exposure are available upon request. Figure 2 shows the difference in b* color values between unexposed samples and sterilized samples at Day 42—after e-beam radiation at both 25 and 50 kGy. 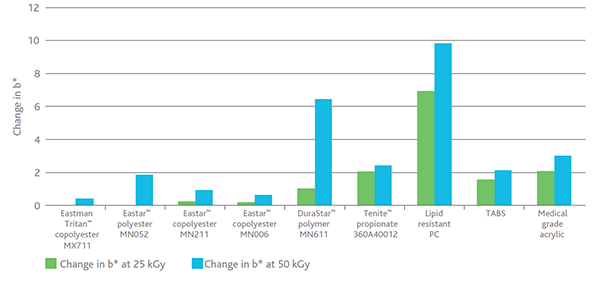 Physical properties were measured before and after e-beam sterilization at 25 and 50 kGy. No physical property degradation was noted for Tritan MX711 or the other resins tested. The polyesters and copolyesters in the study showed no statistical change in molecular weight although Tenite™ propionate 360 did show a loss of molecular weight, as expected from an aliphatic polymer. For complete details of these studies or more information about the advantages of Eastman Tritan™ copolyesters, email Eastman today.